This is my take on the classic shamrock shake! 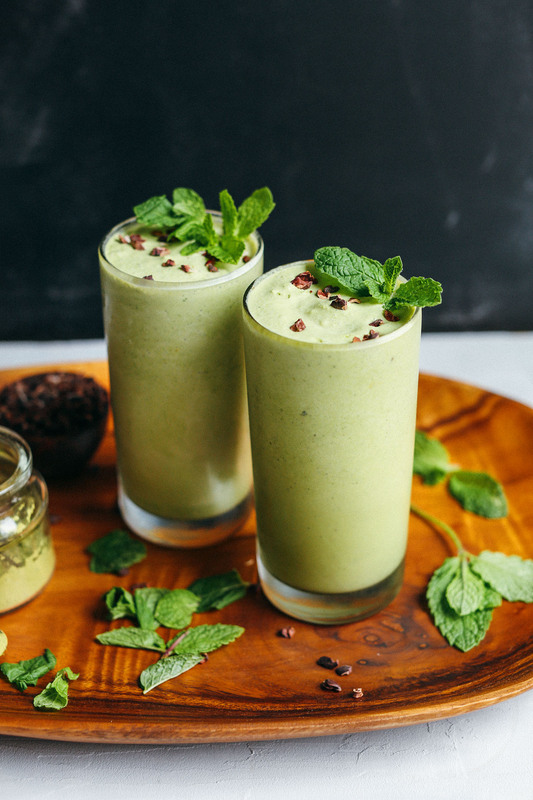 It’s creamy, minty, refreshing, and way healthier than the original! Plus, just 6 ingredients required, it’s 100% plant-based, and is refined sugar-free. Shall we? The base is made with frozen coconut milk “ice cubes” blended with almond milk and a dash of coconut cream for thick and creamy texture. The mint flavor comes from fresh mint (!!) and peppermint extract. A handful of spinach adds some nutrients as well as a vibrant green color. And the shake is naturally sweetened with maple syrup or stevia. For more dairy-free shakes, check out my Chocolate Peanut Butter Banana Shake, Bourbon Pumpkin Milkshake, Banana Split Smoothie, 3-Ingredient Mocha Milkshake, Cold Brew Caramel Frappucino, and Cold Brew Mocha Frappuccino. If you try this shake, let us know! Tag a photo #minimalistbaker on Instagram, and make sure to leave a comment and rating. Cheers, friends! 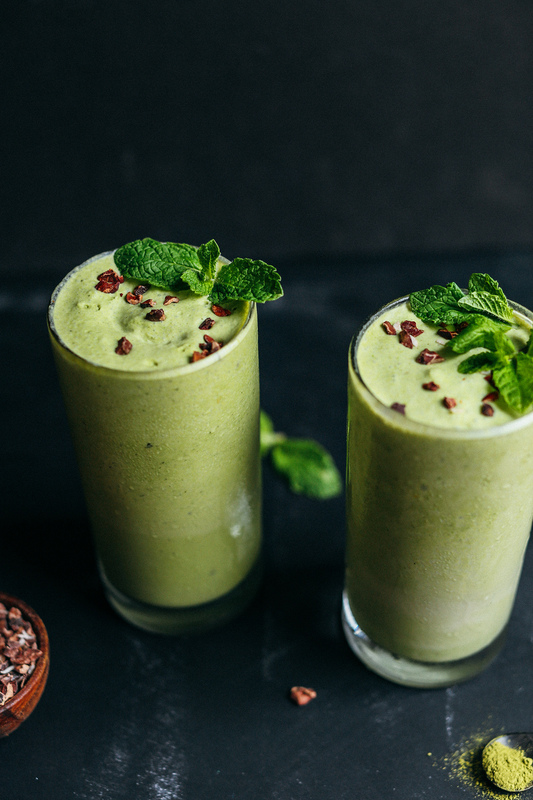 A vegan spin on the classic shamrock shake with matcha, coconut milk, real mint and peppermint oil! Naturally sweetened + perfect for St. Patrick's Day. To make coconut ice cubes, pour a can of well-shaken light or full fat coconut milk into an ice cube tray and freeze until firm - 4-6 hours, or overnight. 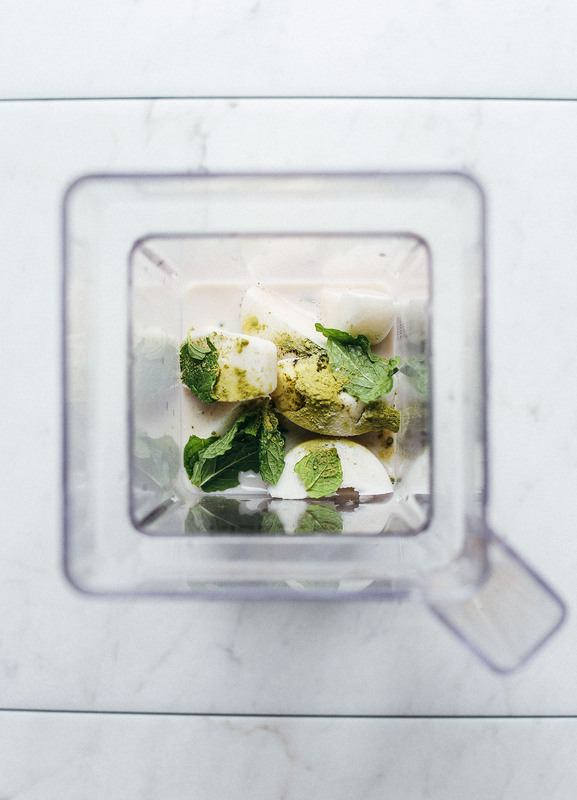 Once frozen, put the coconut "ice" cubes into a blender, along with peppermint extract, vanilla extract, fresh mint, matcha powder (optional), coconut cream, lesser amount of almond milk (1/2 cup or 120 ml as original recipe is written), maple syrup, and spinach (optional). Blend on high, scraping down sides as needed, until creamy and smooth. If too thick, thin with a bit more almond milk. If too thin, add a little ice. Taste and adjust flavor as needed, adding more peppermint extract for minty flavor, spinach for green color, or maple syrup for sweetness. 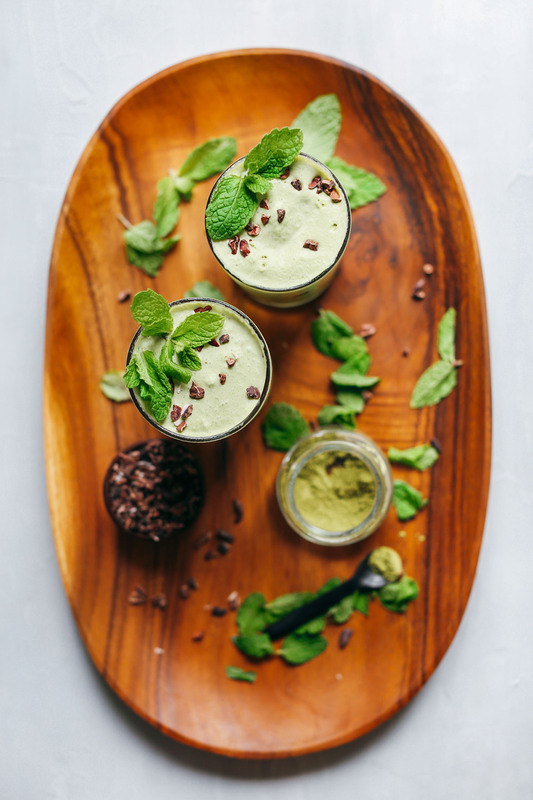 Divide between two serving glasses and garnish with fresh mint and cacao nibs (optional). Coconut whipped cream would also be a lovely topping! Best when fresh. Leftovers still keep in the freezer (covered) up to 5 days. *I used light coconut milk, but full fat would yield a richer, creamier shake. If using full fat, feel free to omit the additional coconut cream. *In place of coconut cream you could also sub 1/4 cup soaked + drained raw cashews. *You could make this shake boozy with a shot (2-3 ounces) Irish Whiskey, Bailey's, or Creme de Menthe. *Prep time includes freezing coconut ice cubes. Hi! Great recipe, what kind of peppermint oil can we use? Any suggestion? AFAIK, not all available are edible, right? Thanks! Hi Ana, any food-grade peppermint oil should work! Hope that helps! This shake turned out absolutely delicious! It was perfectly sweet, minty, and creamy. I omitted the mint extract, using only fresh spearmint, and I used about double the amount called for. I also eyeballed the almond milk, adding just enough to get the consistency I wanted as it blended. I found that freezing the coconut milk into ice cubes is essential to get the right texture. I substituted baby kale for spinach. 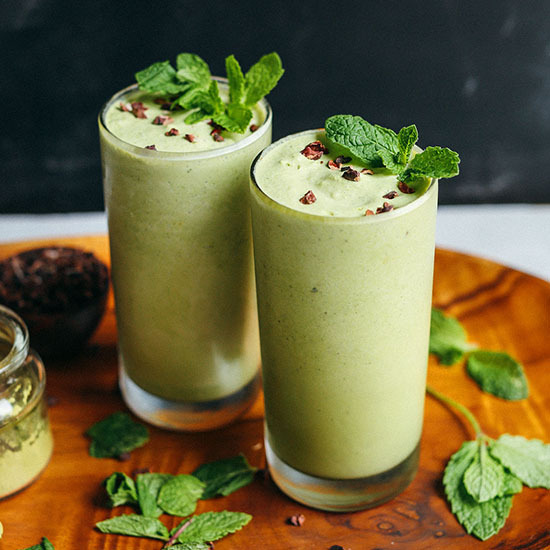 The matcha works wonderfully in this recipe as it adds another depth of flavor which really brings the shake full circle. I also used more matcha than was called for, about 1 tsp for one serving (although I am very accustomed to matcha flavor so that might be why I added more). I loved this recipe so much and it will definitely be a staple in my book. I found this recipe to be too vague, especially in the peppermint flavoring. 1/4 and 1/2 teaspoon are very different measurements and peppermint oil and extract have different flavor strength (oil is WAY stronger). Overall the recipe itself wasn’t hard to follow but I was very apprehensive when making it because of the number of optional ingredients that to me seems would have made a big difference. In the end the shake itself was bad and I would not recommend this recipe. This was so yummy without all the guilt! Another great recipe from this website. Great web site! I will be back. am I the only guy here? This was super easy and delicious! Definitely tasted like a shamrock shake. I’d say go easy on the peppermint extract but I used ice cubes which may have made it stronger. I didnt have frozen coconut on hand or coconut cream that I was willing to open for a couple tablespoons. So I did ice cubes and all coconut milk for the liquid. It was delicious but can see how you would benefit from frozen coconut milk cubes. All and all a major win in my book! Would love to make this recipe. I have all the ingredients except coconut milk. Could I substitute it for anything else? Just have the ice cubes be coconut cream? Thanks! I think that would work, Aimee! You could probably use another nut milk if you have any on hand! This recipe inspired me to make a version using what I had, so I substituted coconut water for the coconut milk, greek yogurt for the coconut cream and a kiwi for the maple syrup. The mint and spinach gave it a great color and flavor, and a threw in a few frozen strawberries for sweetness. It was light, minty and refreshing. Thank you! Was it high in carbs?